It was something I did often in high school and college – the ol’ all-night movie marathon. As a 36-year-old married adult with 2 children, the concept of staying up all through the night watching movies is something that sounds unreasonable and completely illogical. But then I saw the advertisement pop up in my Facebook feed… the Cinema Arts Centre in Huntington, Long Island, NY, was hosting an all-night horror movie marathon. 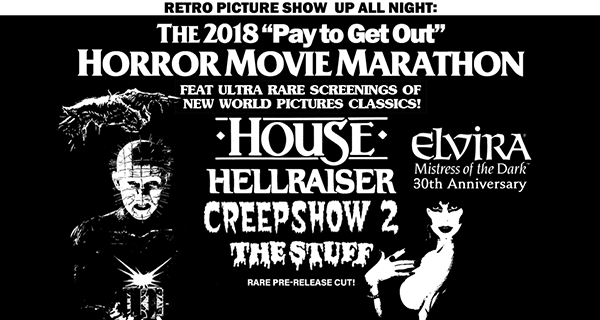 It took me over a week of intense debate as to whether I should do it, but on Saturday morning, with my wife’s permission (of course), I purchased my ticket for their 2018 Up All Night “Pay to Get Out” Horror Movie Marathon and headed out to meet my fate… 8 horror films in 13 hours, one last great All Nighter… for now.